After a snug night on board the Liberty Clipper, the stomach rumbles for a hearty breakfast. Since the galley will not serve until tomorrow, we five early arrivals head into Canton to find breakfast. A short walk from that marina Jim points out the old American Can Company. Family history has it that our great grandfather was one of the founders of the once thriving Baltimore landmark, now restored into loft apartments, offices and shops. It was a delight to see a bit of our history still standing. We have no concrete records of our great grandfather Stansbury's role in American Can in the late 1800's, but we do know that our grandfather started his career there, and moved on to open a cannery in Richmond, and from there he traveled throughout the Southeast building canneries, with the last one established in Havana, Cuba around 1918. History or hearsay, the Stansbury men were speculators, innovators and risk-takers from the get go. "Every part of the pig, except the oink..."informed our waitress. The description was the warning. I'll leave the scrapple to the die-hard Baltimorians. With our day free until 3:00, when we would meet our ship's captain and crew along with the other guest for an orientation meeting, safety briefing and instructions for the Parade of Sail and evening agenda, Jim and I set out to tour the marina and inspect our competition. By our best count there were somewhere over thirty-five schooners in the race. 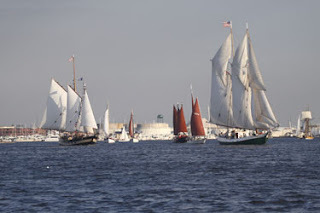 A schooner is a double-masted sailing vessel, and in this race entries were divided into four classes based on length from 128' down to 46'. There were seven boats in our class of over 100' in length. Every boat was a beauty, many vintage vessels included from as early as 1928, each with lots of polished teak, glistening brass and proud crews. It was just as much fun to view the other boats in the marina, giant yachts, flashy speedboats, and leisure cruisers. We wondered why so many of the motor boats stayed moored in the marina When we watched our engineer fill up our boat with diesel fuel at price tag of nearly $3,000 to fill the tank, it was easy to understand. I have always loved a marina, with the music of tack clinging against masts in the gentle breezes, the easy relaxed attitude of sailors and their K-9 companions, the lazy casting of a fishermen. Even the smell of fuel and varnish bring back fond memories. It is a peaceful community and one we spent lots of time in growing up. But the day is quickly slipping away, so we grab some lunch at the Bay Cafe where we can sit outside and continue to enjoy the beautiful weather and marina sounds. 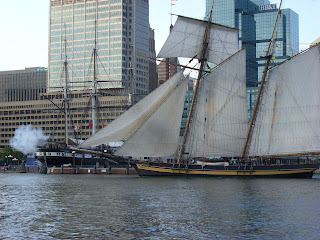 Then it back to the ship to prepare of the Parade of Sail. 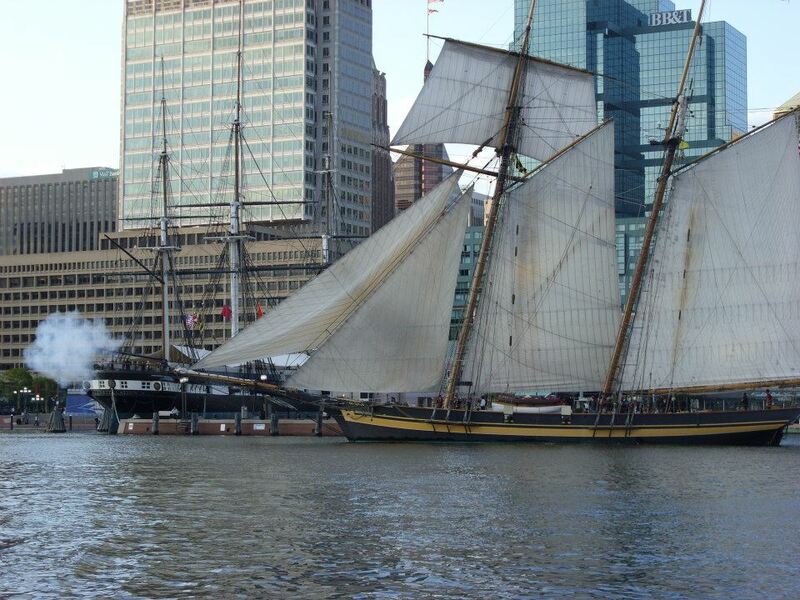 It's a thrilling sight to see these tall ships under sail, and to be a part of the spectacle. Upon leaving the marina, all thirty-seven ships put up full sails to the gentle wind and make way for Baltimore's downtown harbor. Spirits are high as the festivities get underway, and our fellow sailors are jolly with cocktails in hand. We were called to put down our cups and heave-ho the main sail. I loved putting my back into the effort to raise a canvas weighing nearly a ton. What fun to participate in at least a small way. be sailing so close to the glitzy sky scrappers of downtown, where we could see office workers at windows and on balconies watching the show. 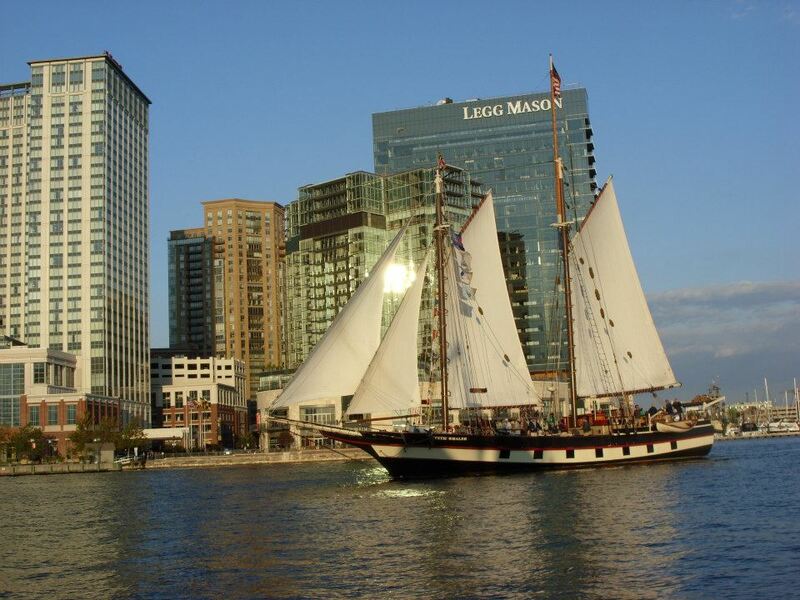 Baltimore is the seat of many corporations and factories, including the Domino Sugar plant. Baltimore also has a wonderful sea aquarium and busting nightlife in its hub. You can bet there were a few sloshed drinks with that surprise. After about an hour of hoopla in the harbor we headed back to the marina. Time for dinner and carousing with the crews and guests of all the boats at nearby Bo Brook's Restaurant. It was a festive night and a rousing sendoff for the big day to come. After filling our bellies and weaving our way through the bulging crowd that packed this festive domain, Jim and I decided to head back to the boat to grab our ditty bags and towels, and headed for the marina showers. After our first experience with the ship-board showers the previous night, so tiny one feels a bit like a cork in a bottle, we decided to take advantages of the more luxurious facilities on land while we could and before the evening crowd. The chilly night air, an afternoon of sailing and sun, and a good meal made my eyes heavy and my body ready to rest. I turned in early for a good night's sleep and dreams of the adventures to lay ahead.